A small city needs one of two things to jack up housing demand: more people or wealthier people. Unlike the rest of Florida, Panama City hasn't really attracted either, mainly because it's isolated on Florida's panhandle. The interstate highway system bypasses it, and the runway at the local airport isn't long enough to support anything beyond regional jets. 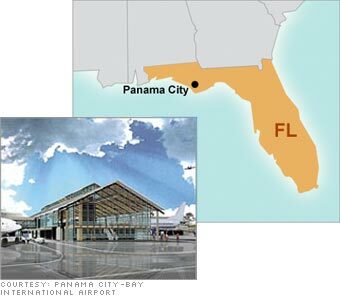 But now Panama City is poised to host big airliners, more visitors - and a lot more buyers. State and local governments and a top regional developer, St. Joe Co., are planning to build a new airport by 2008 at a cost of more than $300 million. Locals expect the new facility to open up the region the way Southwest Florida International Airport in Fort Myers helped drive a housing boom along Florida's southwestern coast in the 1980s. "Panama City is an economy waiting to break out," says Steven Cochrane, chief regional economist for Moody's Economy.com. Other factors increasing demand: Property prices are still low by Florida standards, and the local market has already absorbed a price correction after peaking last year. Janet Roan, a Century 21 agent in Panama City, notes that two-bedroom beachfront condos are going for as little as $330,000 - down by more than $100,000 from 2005.